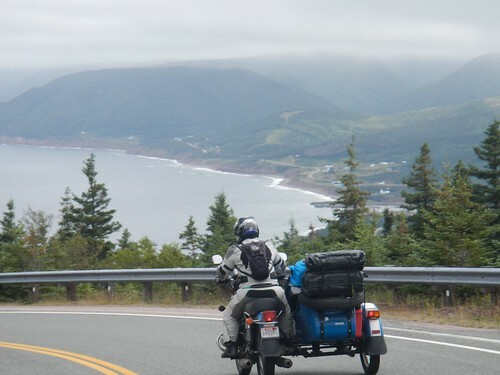 At long last, the day had dawned – today was the day we would ride the Cabot Trail! As it's THE thing that everyone says you must do in Nova Scotia, we'd been looking forward to this as one of the highlights of the trip. After stopping early yesterday, we were both feeling fairly well rested today, and we woke up early and were breakfasted and loaded up on the bikes by 9:30ish. Happily, laying my boots out and blowing a fan into them until around 6:30am had turned them from portable puddles to mildly damp boots. I could deal with that. Unfortunately for Kay, me putting his boots in front of the fan for 3 hours this morning didn't make much of a difference, so he went with garbage bags in his boots to keep his feet dry-ish – a trick I'd had to employ toward the end of the Americas trip when my last set of boots stopped being waterproof. The fog had cleared somewhat when we set out, so we were actually able to see the shore on the other side of the harbour from where we'd slept last night. 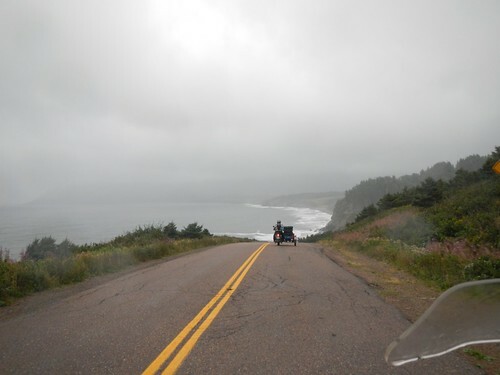 And we were hopeful that we might have a dry-ish day to ride the Cabot Trail! 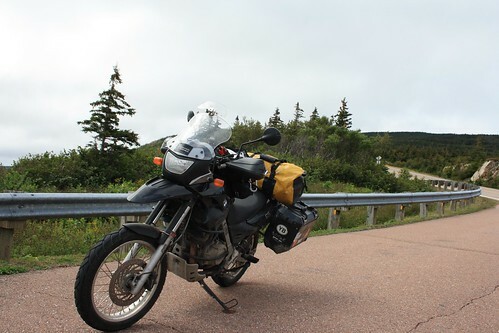 The first stretch between Margaree Harbour and Cheticamp consisted of a surprisingly poor-quality road. 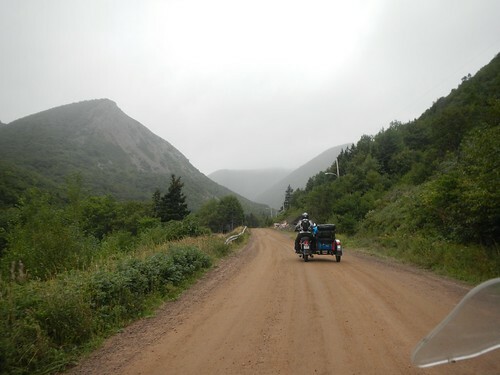 We were caught off guard by such bad road conditions – lots of potholes, frost heaves and bumps that made us drive a little slower and made the Ural lurch all over the place every time I hit something. 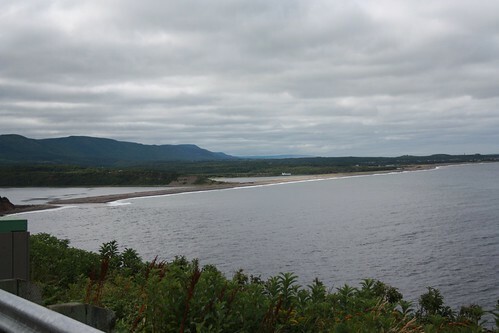 This was the main tourist route on Cape Breton, and a road that brought people from all over the world for the scenic drive… and the first stretch was crap. 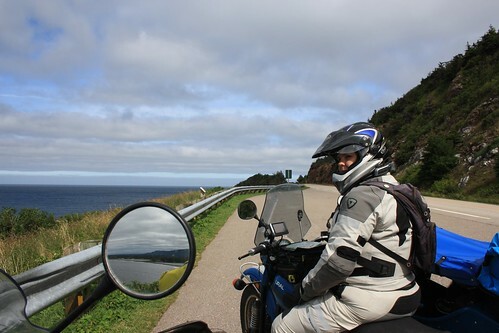 The views were nice enough, though, with the ocean lurking off to our left and putting in an appearance now and again, and twisty roads that probably would have been a pleasure to ride on the F650 but were a fair amount of work on the Ural. 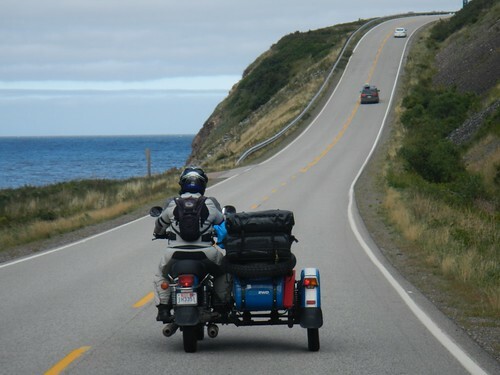 In Cheticamp, we stopped to gas up the Ural, as we'd been told there would be no gas for a 150km stretch – the very edge of the Ural's range (have we mentioned we get crap gas mileage?) On the way out of town, I tried to stop at a bakery that I'd been seeing signs for since we'd set out this morning, but we discovered that it was closed for Labor Day. Boo. It's the first time on this entire trip that I felt like randomly stopping at one of the bakeries along the way, and I was thwarted. Oh well. 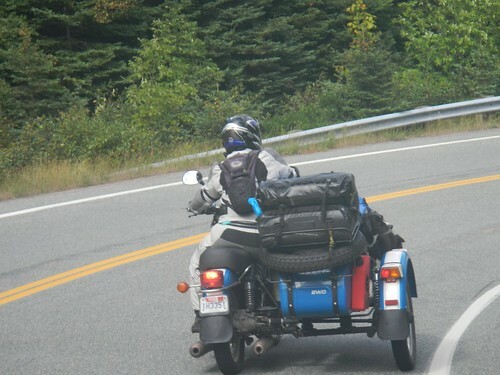 On to the Cabot Trail! 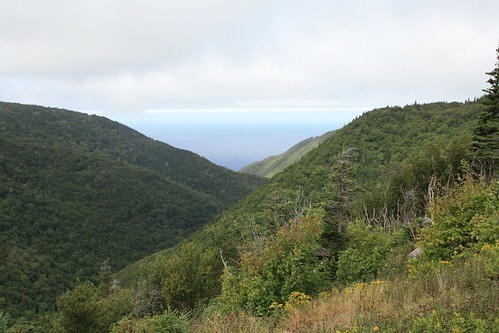 A little way down the road, we entered the Cape Breton Highlands National Park. I pulled off to acquire us park passes, as we figured we'd stop and do some walking at some points along the way to get the dogs out and about. You don't need park passes to just drive through, but if you want to park at any of the sites along the way, you need the pass. We wanted to park. Early on, the road had a lot of vertical and twisty stretches. We hit a scenic overlook, and I asked Kay if he wanted to stop and take pictures, and he responded “I… guess?” He didn't seem that interested, so I skipped the turnoff and he said that I should basically stop anywhere I felt like stopping. I was a bit surprised, as he's usually the one who's all gung-ho to snap pictures, but apparently not today – in the midst of all this beautiful. We drove. We stopped at overlooks. We took pictures. It was beautiful. Alas, even rising a few hundred feet in altitude put us in the clouds and fog. We started getting moist, and we put down one of the sides to keep the dogs drier, but left the other one open so they'd still have fresh air and a chance to move around. Down a steep stretch that included some hairpin turns, and we encountered the Rusty Anchor. It was around lunchtime, and I didn't know how many other restaurants we'd see along the way, so I suggested we stop and grab a bite. Sadly, it was one of the most disappointing meals we've had on the trip. We got a sampler that included a wide variety of seafood, from which they somehow managed to extract all of the flavor. It didn't taste of much of anything. Easily some of the poorest seafood we've had here in Nova Scotia, where everything is fresh and flavorful. I got a chicken club, which was decidedly “meh,” and Kay foolishly got a veggie burger, which was so boring and tasteless that he only managed to eat half of it. 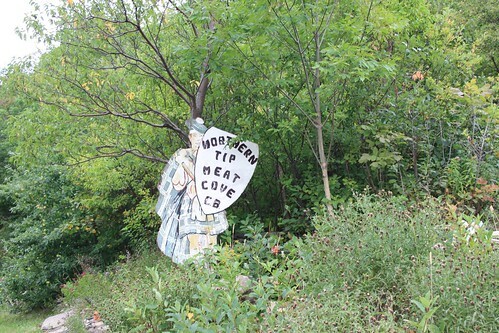 If you ever do the Cabot Trail, skip this food stop. There are a couple of other restaurants further along, and they can't be as bad as this. Particularly for the price, which was over $50 again. They love to gouge them some tourists up here. While we were at lunch, we consulted our guidebook and I discovered there was a waterfall not far along that was close to the parking lot. 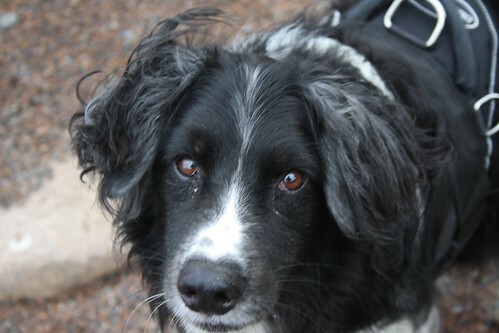 Seemed like it would be a good excuse to get the doggies out for a little walk and take some beauty shots. We found the turnoff for the waterfall just where it was supposed to be, but the book didn't mention it was down a 2km dirt road. The dirt was flat and smooth – except where it wasn't. More puddle-filled potholes reminded me of yesterday's trip up the TCT. Back on the bikes again, and more pretty riding through national park. As we went up in elevation again, though, the mist was getting more moist. My jacket was pretty damp, although I was staying dry enough on the inside, and I added the Frogg Toggs in an attempt to keep my legs warm. I also put on the fleece under the jacket for some extra warmth, and I was glad of it. 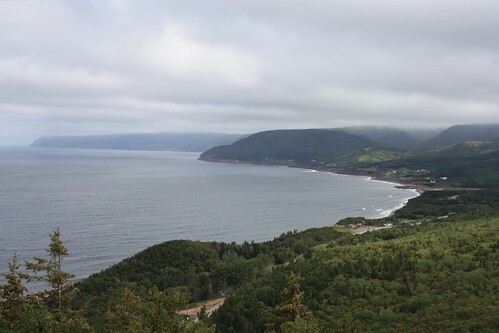 And then we were approaching the turnoff for Meat Cove, the northernmost point on Cape Breton. I'd read about it being a pretty, secluded cove, and it was supposed to be lovely and not particularly touristed. Our motorcycle ride guide said that it was a gravel road, though, that only experienced riders should undertake. 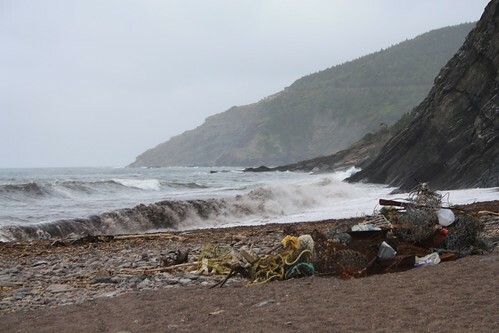 We laughed at the warning, and after a little stressing over the Ural's gas range (we happily found a gas station a little further past the Meat Cove turnoff, so we came back to check it out) we headed up the road to this site. The ride there was pretty boring for the first 25km or so. It's only the last 8km-ish that is unpaved, and at first, that seemed pretty boring, too. But then it started getting a little bit moist, and there wasn't much gravel – it was mostly hard-packed dirt that got slippery when wet. 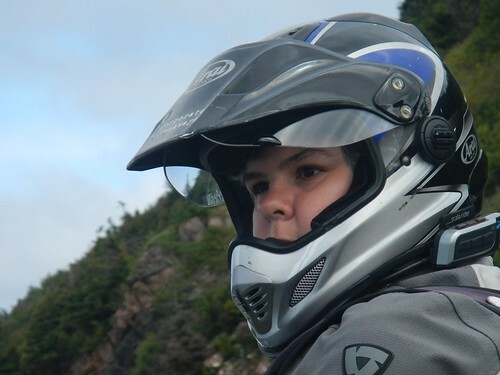 And I was on the Ural, which didn't have great engine braking, and there was some up and down bits near sheer cliffs with some twists thrown in to boot, and I have a minor problem with heights, so I wasn't thrilled about the riding. Add in a fair amount of washboard corrugations, and more potholey sections like we rode yesterday, and it was a pretty bumpy ride, both literally and figuratively. I was glad Kay had been riding the Ural yesterday, but I felt like I should tackle this today just to get some experience handling the Ural under conditions like this. 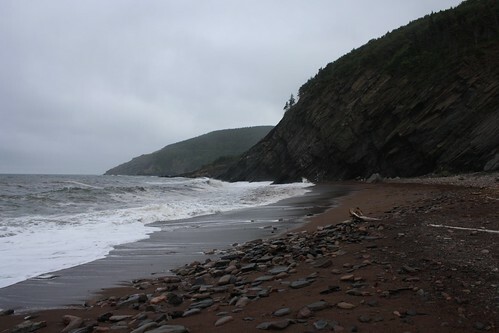 And then we went back to Meat Cove Beach, which was down a gnarly steep hill with major rain ruts that ran all over the place, and it was slippery, to boot. The waves were pretty intense in this stormy weather. 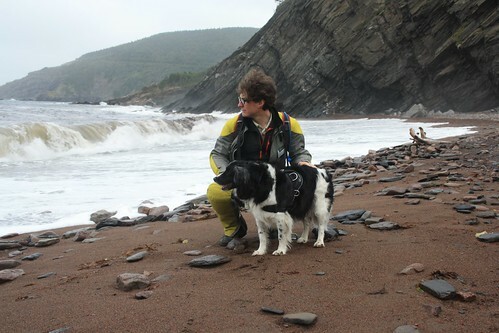 My dog, who had happily played in the waves on the sunny beach on the eastern shore of Nova Scotia, showed no interest in playing in these sizable waves that were breaking so close to shore. Which was just as well, because I thought the currents would probably be pretty dangerous, so I was glad to have him stay out of the water. It didn't stop him from enjoying the beach, though. Stop complete, it was back up the slippery, steep, rain-rutted hill to the main road, and there was a moment when the Ural was sliding sideways and I was just sure I was going to hit the wooden guard rail at the side of the hill – and hopefully it would stop me from falling off the small cliff. But miraculously the Ural caught traction at the end, and we made it, and Kay made it safely up on the F650 behind me. Phew. Back down the bumpy road, and this side trip had taken a lot out of me. My wrists felt beat up from trying to manhandle the Ural though all of the bumps and keep it going on a straight line. I talked with Kay about it later, and he grips the bars differently, so he gets more strain in his biceps and pecs, and I get it in my wrists – I push the right handlebar more and he pulls the left one more when it comes to steering the Ural. The mist had picked up more while we were stopped, and I was just starting to feel damp and worn out after the effort and stress of the Meat Cove road. 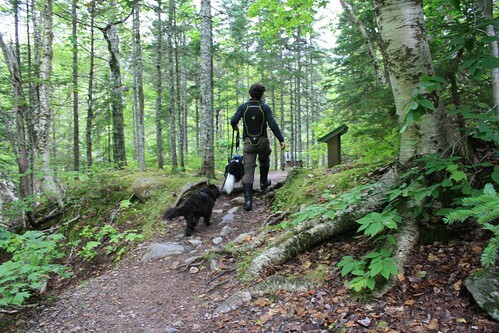 Back to the main trail, and we headed toward Ingonish, where I expected to find gas for the Ural. 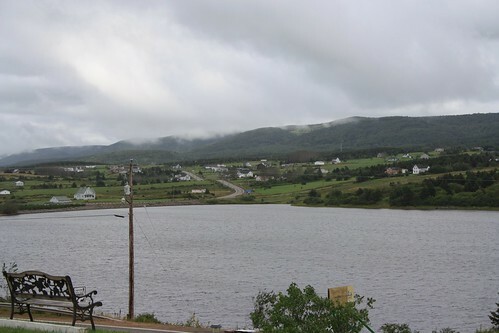 We rolled into Ingonish shortly after 5pm, and I chatted with the guy at the service station while we filled up. I told him we were heading south, and he asked where we were going. I wasn't sure, but we'd like to stop when we get tired – and is there a place where he'd recommend stopping? 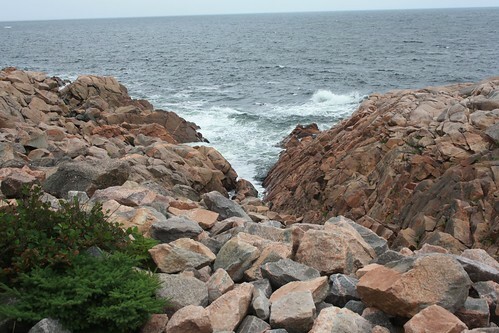 He replied “Here” – apparently there wasn't much between Ingonish and Baddeck, 100km south of us. 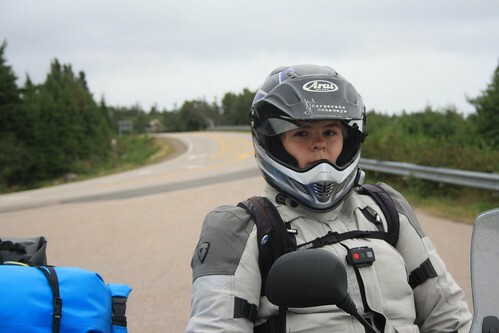 It was around 5pm, and I was feeling pooped – the idea of piloting the Ural through another 100km of twisties at this point just felt too daunting to handle. I didn't think I'd have it in me to do it safely. Kay suggested that we try to eat and then head south, but I knew it would be around 6pm by the time we headed out after eating, and I was worn out in a way that I didn't feel eating would be able to correct. So we'd be riding until close to dark to get south, and I didn't feel up to driving the Ural that far at this point, so the only sensible thing seemed to be to call it for the day and get a fresh start tomorrow. 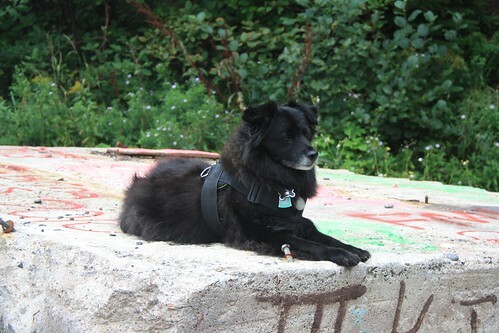 We consulted the guidebook for dog-friendly lodging, and rode to one a few kilometers south of us – and as we were riding, we passed another one I'd seen that had a restaurant and a coffee shop on-site. There's a lot to be said for food that's RIGHT THERE when you're stopping for the night – no need for one of us to gear up again and run off for food. It also helps us get on the road faster in the morning when we don't have to go somewhere for breakfast, or get on the road and stop again shortly after. So we took the place that had food nearby, which was roughly the same price as last night's stop but had a way nicer room. Why weren't we camping, you ask? Because we discovered this morning that the Twisted Throttle dry bag was no longer dry, and our sleeping pads were soaked. We couldn't put wet sleeping pads in our dry down sleeping bag (which thankfully lives in a different dry sack that was still dry) so we had no sleeping pads… and our sleeping bag doesn't have any insulation or padding on the bottom because it's meant to be used with sleeping pads, so we'd have nothing between us and the cold ground. If you know anything about camping, you know that's a bad idea – so we felt the only option was to stop at a hotel and get the sleeping mats off the bike, bring them in, inflate them, and let them dry overnight. Which we did. I've got a few spare dry bags I bring along in case something gets a hole in it, or in case we discover something else that should live in a dry bag – so our sleeping pads and my inflatable pillow are now in their own dry bag. The hotel was actually a beachside resort. 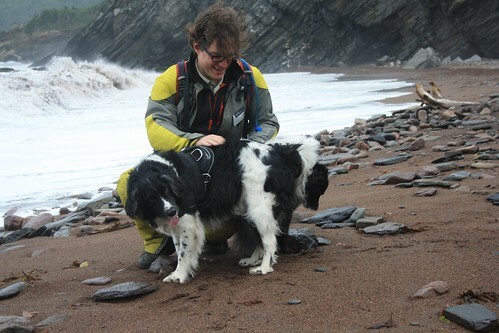 We ventured down to the beach with the dogs in the mist, and discovered that recent storms had washed a whole bunch of kelp up onto the shore. Rotting kelp has a very distinctive smell, which followed us to our room, sadly. But the room itself was nicer than we've encountered recently, so the smell seemed like a small enough price to pay. 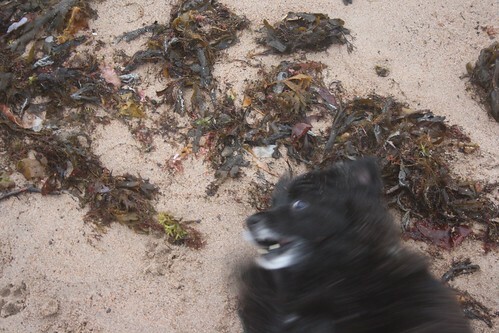 'dido enjoyed a good roll in the stinky kelp. 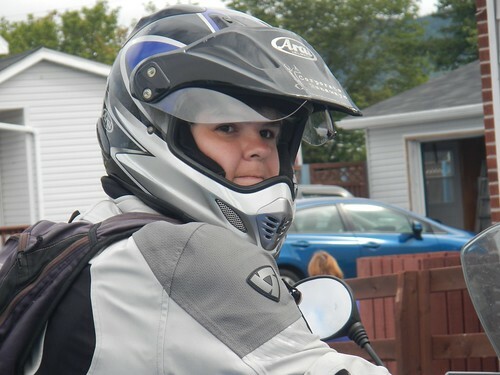 Wandering up to the on-site pub to grab some takeout we could bring back to our rooms, we encountered a couple of other bikers stopping for the night – on Victory motorcycles. I spotted some interesting-looking bags, so while Kay went in to order our food, I asked the gent about the bags when he came back. We started chatting, and he and his wife were super friendly and we had a nice long chat about the bikes (and the dogs). Kay ended up sitting on his Victory, which seemed super comfortable – very much like a Goldwing – and we started talking about the possibility of going with a comfy touring bike. They convinced me to try the Victory, and I don't believe I've sat on a bike that comfy – I could definitely see us gravitating toward something like that as we age. Particularly as Kay's back has been bothering him since yesterday – comfy bike built for long distances seems like it has a definite place in the grand scheme of things, and I wouldn't be surprised to see us going toward something like that in another decade or two. Headed back to the room with our pub grub after a nice long chat with them, and we enjoyed some Canadian tv and an early night. 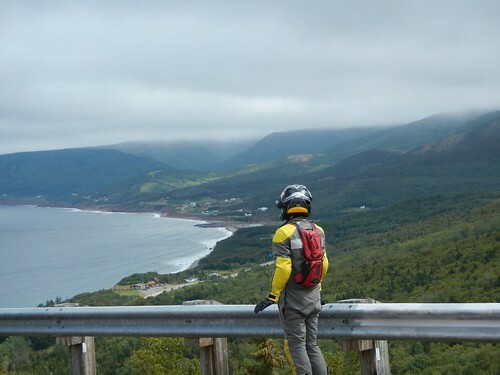 It's really gratifying to be warm and dry after a misty day on the bikes, and more Cabot Trail to explore tomorrow.